V-1SDI is a flexible and versatile video switcher that makes it easy to connect and switch professional 3G SDI cameras and playback sources along with HDMI sources including cameras, smart phones, computers, tablets, Blu-ray players. 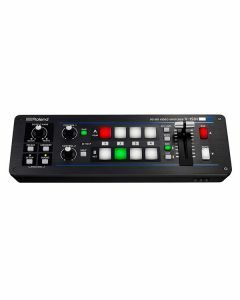 Compact and portable, the V-1SDI delivers professional switching results with its easy to use hardware interface complete with T-Fader and easy-to-see backlit buttons. Webcasters and videographers with SDI cameras can create professional quality content simply and effectively with the V-1SDI. The V-1SDI’s support of SDI for long-distance camera connections as well as RS-232 for control from system controllers make it ideal for fixed installations. The V-1SDI’s compact and portable size makes it easy to support live event switching no matter the size or location of the venue. The V-1SDI has two dedicated 3G SDI inputs, a third channel input that supports 3G SDI or HDMI and a fourth channel HDMI input that also includes scaling. This makes the V-1SDI ideal in a variety of configurations for both an all camera applications and applications that mix cameras, video sources and computer data sources. Inputs 1 to 3 of the V-1SDI support 1080p/1080i/720p video resolutions with Input 4’s scaler supporting a wider range of video and VESA resolutions. Both progressive and interlace signals can be input allowing for both 1080i and 1080p signals to be used at the same time. HDCP is supported* for input of copy protected content from devices such as Blu-ray disc players. *Video is only output from HDMI when HDCP is enabled. SDI outputs are disabled when HDCP is enabled. The V-1SDI has two 3G SDI Outputs and one HDMI output. SDI PVW and MULTI-VIEW outputs are assignable from Program, Multi-view Preview or Full Frame Preview for flexibility in different applications where output display devices support either SDI or HDMI inputs. HDMI INPUT 3--4: Type A (19 pins) x 2 * HDCP Supported * INPUT 3: SDI or HDMI selected. HDMI INPUT 3 720/59.94p, 720/50p SMPTE 296M(FORMAT switch = 720p) 1080/59.94i, 1080/50i, 1080/59.94p, 1080/50p SMPTE 274M(FORMAT switch = 1080i or 1080p) * The input interlaced video signal is converted to progressive video signal by internal processing. * The video signal frame rate can be selected at the SETUP menu (59.94 or 50). UXGA (1600 x 1200/60 Hz), WUXGA (1920 x 1200/60 Hz) * The refresh rate is the maximum value of each resolution. * Conforms to VESA DMT Version 1.0 Revision 11. * 1920 x 1200/60 Hz: Reduced blanking. * The input interlaced video signal is converted to progressive video signal by internal processing. * The video signal frame rate can be selected at the SETUP menu (59.94 or 50). 1080/59.94p, 1080/50p SMPTE 274M(FORMAT switch = 1080p) * The video signal frame rate can be selected at the SETUP menu (59.94 or 50).